In my humble opinion its his best since Layla. We get nearly all styles he has already tried. Everything is great aside from Black Rose which is "only" normal. Hold me lord is his own nice country gospel (I Love the chorus), I cant stand it and Catch me if you can are quite similar in melody and mood, but I love both. Nice solo in the later. Floating bridge is his best blues since 1976 Double Trouble. Great guitar solo. Blow wind blow is just as good. I love both Muddy and Eric so listening to this makes me really pleased. I think he should record a blues album just full of Muddy Waters classics. I think it would be great. Another ticket is a nice ballad with great heartfelt vocal from Eric and on the other hand, the singing on Rita Mae is just pro forma, because it is all about long furious soloing. Man I LOVE RITA MAE! Reminds me of Cream somewhat. GREAT!!!! 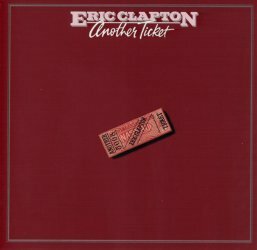 "Another Ticket" is the first studio album by Clapton's new band of all-British musicians which he had assembled in the late summer of 1979. This particular project reminds of the "Blind Faith" album in that the circumstances surrounding its release were less than perfect but the music remains strong and vibrant to the present day. Clapton and his group, which had expanded to include the services of keyboardist/vocalist Gary Brooker(of Procul Harum fame), first attempted to record an album in March and April of 1980 at Surrey Sound Studios in Leatherneck, Surrey, under the guidance of Glyn Johns who had worked successfully with E.C. on such efforts as "Slowhand" and "Backless". The resulting album. "Turn Up Down", was subsequently rejected by RSO Records as it was rumored to contain too much material by Albert Lee and Gary Brooker which detracted from its identity as a Clapton album. Some of the material was abandoned while other songs were re-recorded at Comnpass Point Studios in Nassau with producer Tom Dowd in July and August. The latest sessions produced a piece of work which ranks among E.C. 's best solo albums. "Another Ticket" kicks off in a distinctly unpromising mode with a lightweight Clapton original entitled "Something Special" followed by a C & W influenced "Black Rose" by Troy Seals and Eddie Setser but beginning with a galloping version of "Blow Wind Blow" this album delivers a number of inspired selections. The title song is a beautifully wistful ballad and "I Can't Stand It" is a well constructed J.J. Cale-like rocker which was wisely tapped as the single. Clapton's "Hold Me Lord" is a excellent track with strong lyrics, ensemble vocals and stunning dobro playing, "Floating Bridge" is a haunting blues song written by Sleepy John Estes which is reminiscent of "Double Trouble" from "Just One Night", "Catch Me If You Can" written by Clapton and Gary Brooker is a great blues shuffle with a malstrom of overdubbed guitars and E.C. 's "Rita Mae" is a chilling blues/rock composition with a menacing message and a demonic guitar solo. This closing selection also features inspired relentless drumming by Henry Spinetti which is very similar in feel to Jim Gordan's work with Derek and the Dominos. Unfortunately Clapton never really had the opportunity to showcase this album on the road as a planned U.S. tour which began on March 2, 1981, ended suddenly with his hospitalization for ulcers on March 14th. Despite a searing version of "Rita Mae" featured at the London ARMS concerts in late 1983, only "Blow Wind Blow" was ever accorded much stage exposure. Still, like the "Blind Faith" album from 1969, "Another Ticket" stands the test of time and proved to be Clapton's best solo album since "461 Ocean Boulevard". This album is highly recommended. This is the best song of Clapton, "Another Ticket". Is just a great piece of music and everyone must enjoy it. The album is excellent too. This is the perfect style of Eric. The good style! I think this record represented something of a renaissance for Eric in the studio, probably partly inspired by the superb new band he was recording and touring with (captured live on Just One Night - minus Gary Brooker of course). Eric rediscovers his songwriting prowess on tracks like Another Ticket and Hold Me Lord, and delivers very lyrical and disciplined guitar work throughout (especially on Floating Bridge and Blow Wind Blow). He is also in great voice on this album. All in all, I feel that this was at the time his best studio album since Layla. I really like this record. Clapton has a new band, got the Dominos' producer Tom Dowd and more or less a new sound compared to, say Slowhand and Backless. And more, the guitar is back! Something Special is a self-penned song that's very good, with nich chord-changes, melody and not too sentimental lyrics. Blow Wind Blow is a fast shuffle and the titel-track is a slow ballad, this also written by Eric. Floating bridge, a slow, nice blues with an great guitar tone. Catch Me if You Can and Rita Mae are both such heavy, guitar based that you have to go back to the Dominos - days to find something similar. Those two are my favourite tracks on this album along with Floating Bridge. "Another Ticket" has a hit-single too, I Can't Stand It. It's a good song, all though I like some other songs on here better. There are however two songs I don't care much for: Black Rose and Hold Me lord. If you're a country-fan, you won't be having any troubles with them. But I do admit that Hold Me Lord has an outstanding slide-guitar solo! Eric got rid of his American band, picked up the guitar and stopped writing those heart melting lyrics. The result is very good and this album could be a gem!